Always thinking of an easier way to get all your work done. Share tasks, projects and files with anyone you work with. No more wait Do.com from SalesForce is here. 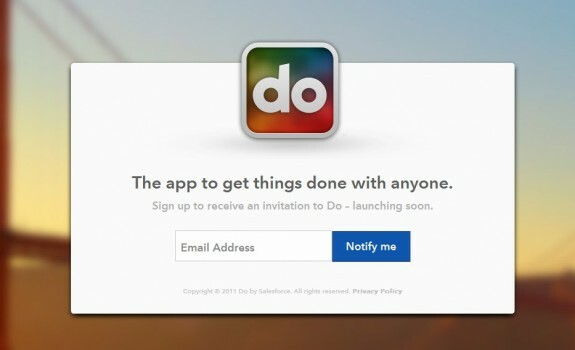 “Do” is a productivity site and app designed to help you get things done, and the next-gen of the service is launching in beta this week. Do.com (get it?) lets you create to-do lists and then assign tasks on that list to other people. Used for both individuals at home and businesses looking to streamline how they work, the service can be used to assign everything from bringing a bag of chips to a party to following up with a client to make sure he or she signs contracts on time. The next generation of the service (it didn’t previously include social media contacts, for example) now offers integration into networks such as Facebook, as well as into your contacts list. If one of your contacts changes profile information, such as his or her employer, then that information will also be changed in Do. Especially useful for businesses that repeat the same processes over time, templates can be created in Do that automatically assign recurring tasks to the appropriate people. For instance, one homebuilder is using Do to assign all of the tasks for building a home. Once a buyer makes a purchase, then assigning out the thousands of tasks involved in that process can be done in a single click. Each task can be commented on, sending a message to both the person assigned to the task and the one doing the assigning. Mobile apps for iPhone and now Android allow everyone to keep up to date on what’s going on all the time, not just when they’re in front of a computer. A Salesforce company, it’s not surprising that Do also has a huge component for sales teams. The beta version of the service has a new Deals component that can be used to track deals and revenue. The full new version of Do is set to go live near the end of August. You can check out the beta by signing uphere.